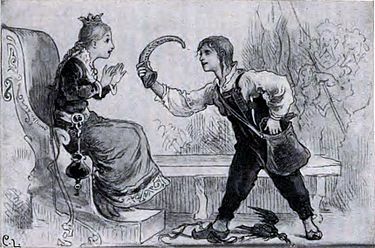 First published in 1843, this fairytale tells of a princess who is "so headstrong and obstinate", that her father the king promises her hand in marriage to the whoever who can silence her tongue. By and by, the royal estate becomes so run down by people, that the king decides that if they fail, they will have their ears swayed with an iron. Nonetheless, three brothers set off to try their luck with the princess. 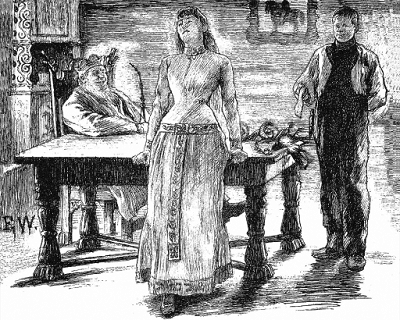 The youngest, called the Ashlad, is a recurring protagonist in Norwegian folktales. Along the way, the boy picks up several items along the way, consequently being ridiculed by his two older brothers. As the story unfolds however, it appears that it is not necessarily the things in question which prove to be helpful in the end. The Ashlads' approach to the road ahead of him reminds us to be attentive and mindful of events and coincidence on our way. Although he is initually mocked in the beginning, it turnes out that doing things differently is perhaps not such a bad idea after all. Once upon a time, there was a king. He had a daughter who was so wayward and whose tongue went so fast, there was no stopping it. Therefore, the king promised that whoever who could shut her up, would not only get to marry the princess, but get half of his kingdom into the bargain. There were plenty of those who wanted to try, I can imagine; a princess and a half-kingdom doesn't come along every day. The gate to the king's farm did not stand still; the suitors came in a heards, from east and west, both riding and walking. But none of them could put the princess to silence. Finally, the king pointed out that those who tried, but could not, were to be branded on both ears with his iron. He refused to have people running around his courtyard for nothing. Then there were three brothers who had heard about the princess. Their names were Per, Pål and Espen Ashlad. Since there was not much to speak of keeping them at home, they wanted to tempt their luck and see if they could win the king's daughter and half the kingdom. They were good friends, so they went off together. When they were well on their way, Askeladden found a dead magpie. "Look at what I found!" he shouted. "What did you find?" asked the brothers. "I found a dead magpie," he said. "Yuck, throw it away! What do you want that for?" said the two, who always thought they were the wisest. "Oh, I have things to do, and this will do," said the Aslad. When they had walked quite a bit, the Ashlad found an old ring of birch. "Now what did you find?" said the brothers. "I found a ring of birch*," he replied. "Poh! What are you gonna do with that? Throw it away!" they said. When they walked a while, he found a pottery shard and picked it up. "Guys, looked at what I found!" he said. "Now what did you find?" asked the brothers. "A shard of pottery," he said. "Huh! That's something to pick up! Throw it away!" they said. "Oh, I have things to do, and this will do," said Askeladden. When they had gone a bit farther, he found a crooked ram's horn, and soon after he found another. "Now what?" asked the brothers. "Two horns," the Ashlad replied. "Throw them away! What are you doing with them?" they groaned. "Oh, I have things to do, and this will do," said the boy. After a while he found a wedge. "Boys, look what I found!" he shouted. "Unbelivable! Now what did you find? " said the two elders. "I found a wedge," he replied. "Oh, throw it away! what do you need all this junk for? " they replied. When they crossed the fields by the king's farm - where they had just spread fresh dung - he bent over and picked up an old, worn out shoe sole. "Wow, guys, look at what I found!" he said. "If only you found some sense before you arrived!" the two said. "What did you find now?" "A worn out sole," he answered. "Ick! As if that's something you need to pick up! Throw it away! What do you want it for?" said the brothers. "Oh, I have things to do, and this will do, if I'm to win the princess and half the kingdom," said the Ashlad. "Yes, you sure look like it!" the two said mockingly. And so they went in to see the princess. First the eldest. "Good day to you too," she answered and turned in her seat. "It sure is warm in here," he said. "It's warmer in the coals," answered the princess; the branding iron was lying there, ready to be used. When he saw that, he couldn't say a word, and he failed. It didn't go better with the second brother. "Good day to you too," she said and turned in her seat. "It's very warm in here," he said. "It's warmer in the coals," she answered. Then the cat got his tongue as well, and the iron was pulled out again. Then it was the Ashlad's turn. "It's nice and warm in here," he said. "It's warmer in the coals," she answered; she did not care to be nicer to him than she was with the others. "I'm afraid she'll burst," said the king's daughter. "Not to worry, I'll put this birch ring around it," said the boy. "It's too wide," she said. "I'll use this wedge," said the boy. "The fat will drip out of her," said the princess. "I'll hold this underneath," answered the boy, showing his broken pottery. "Your words are all crooked," said the princess. "No, I'm not crooked, but this is crooked," answered the boy, pulling out one of the ram's horns. No, I'm not crooked, but this is crooked," answered the boy, pulling out one of the ram's horns. "Now, I've never seen anything like it!" yelled the princess. "Here's one like it," said the boy, and pulled out the other horn. "You're trying to wear me out, aren't you?" she said. "No, but this is worn out," answered the boy, pulling out the sole. The princess didn't know what to say. "Now you're mine," said the Ashlad, and he got her and half the country into the bargain. *Originally "vidjespenning": a traditional ring weaved with soft birch twigs. The ring could typically have a diameter of 10-20 cm, and could be used as bindings for skies, to tie things together, as a door handle, etc.